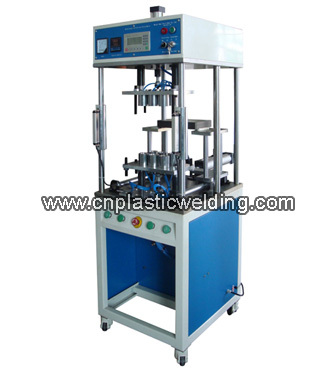 The hot melt machine is a thermoplastic welding equipment using the surface thermal conduction method to melt the surface of the thermoplastic workpiece being welded and can be applied for melting and connection of ultrasonic refractory workpieces, such as water tanks, combination auto lamps, automobile door plates, bumpers and sinks of washing machines, etc.. The hot melt mold is made through profiling carving aided by computer, ensuring the close fit between the mold and workpiece. The identical welding size of the product provides a neat and orderly appearance.